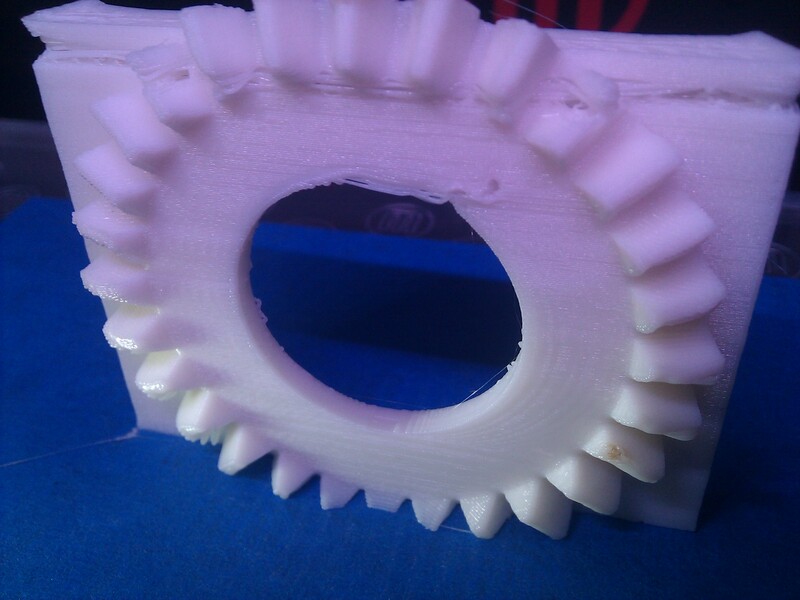 more issues.. the small bevel gear has a little angled contour on the teeth, which means it needs to be printed with support material which is not good. 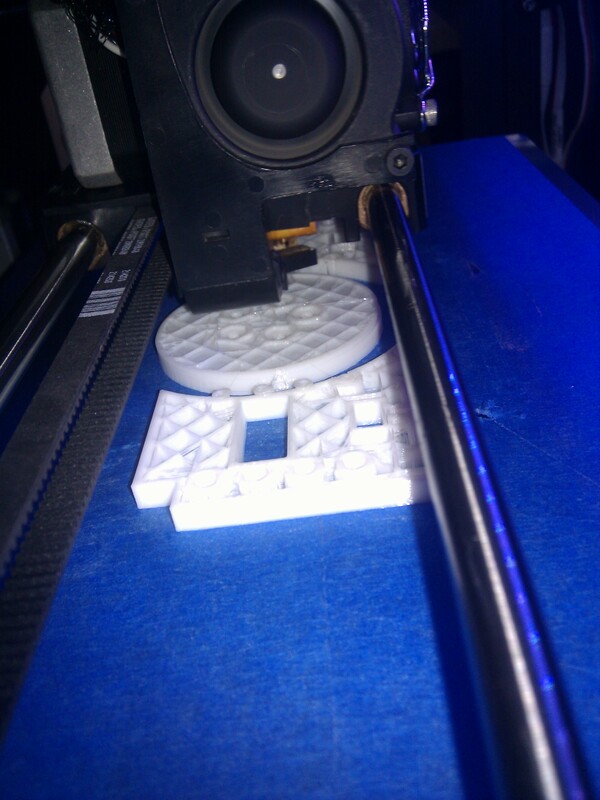 so i'll have to flatten the top part and it can then be printed without support. 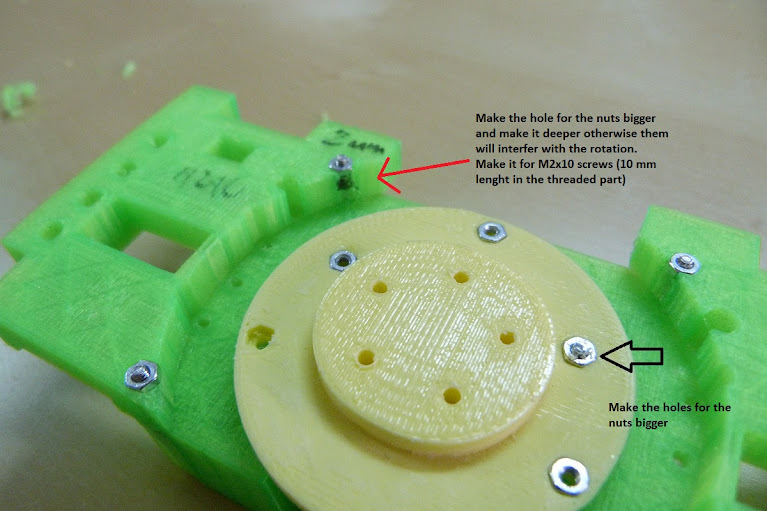 Another issue is that the the AX18 servo's width is indeed a little less than 26mm but when printed, the internal cavity width is 25.7. possibly because of the support material leftovers. 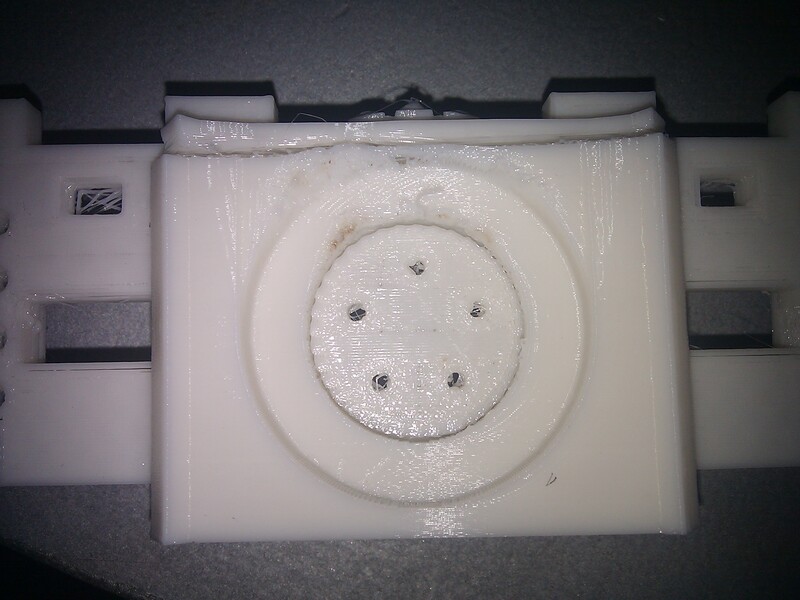 so need to re-print without support material otherwise need to modify the servo cavities to add a bit of space. 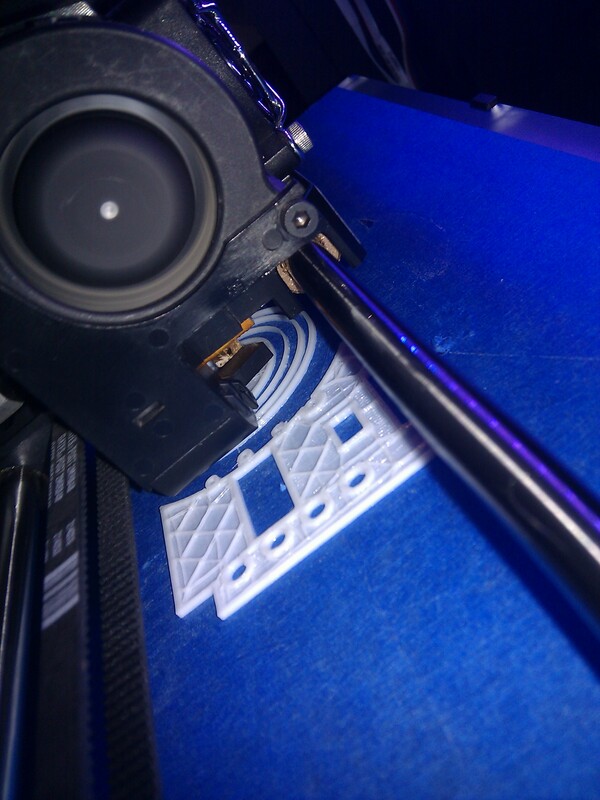 Next I tried to print the upper torso part. 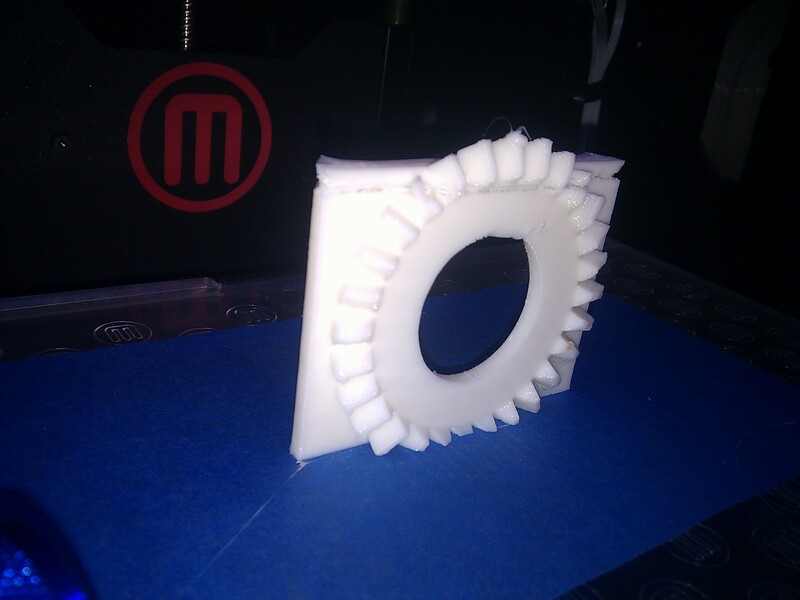 it would be great if it can be printed without support material simply with that big bevel gear facing up. 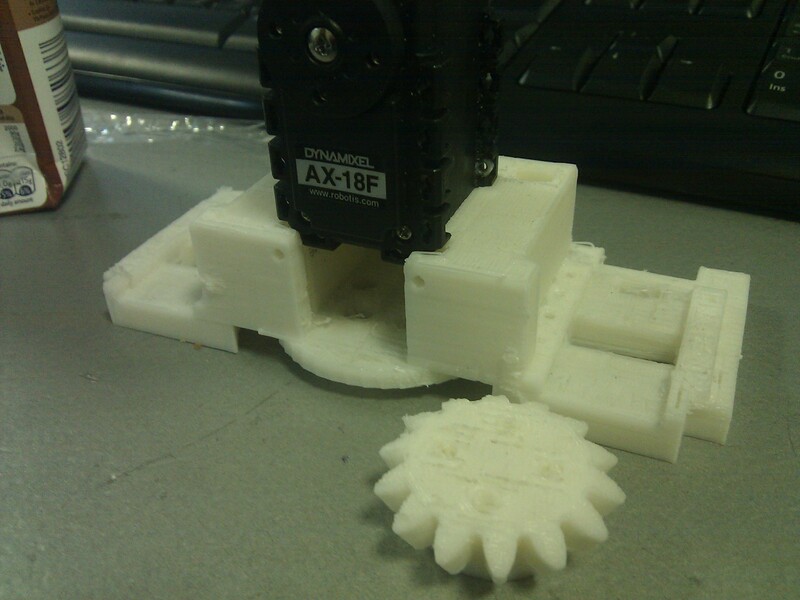 so the part was sliced to expose only the problematic gear. 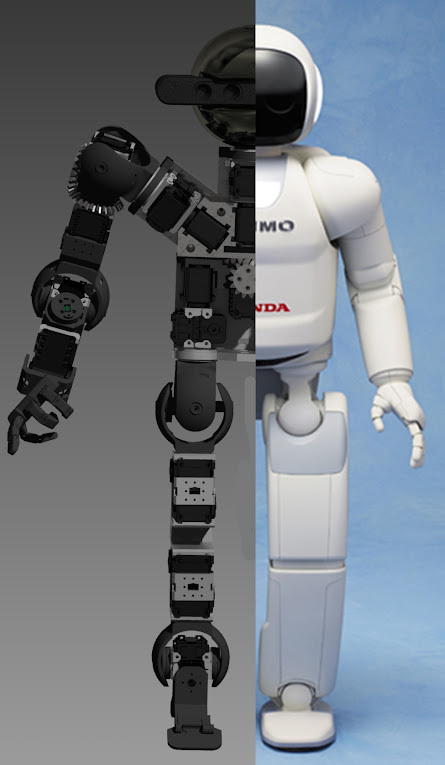 the bottom part was cut off because effectively only the top 90 degrees will ever be used to rotate the torso. The result on first look is not bad. 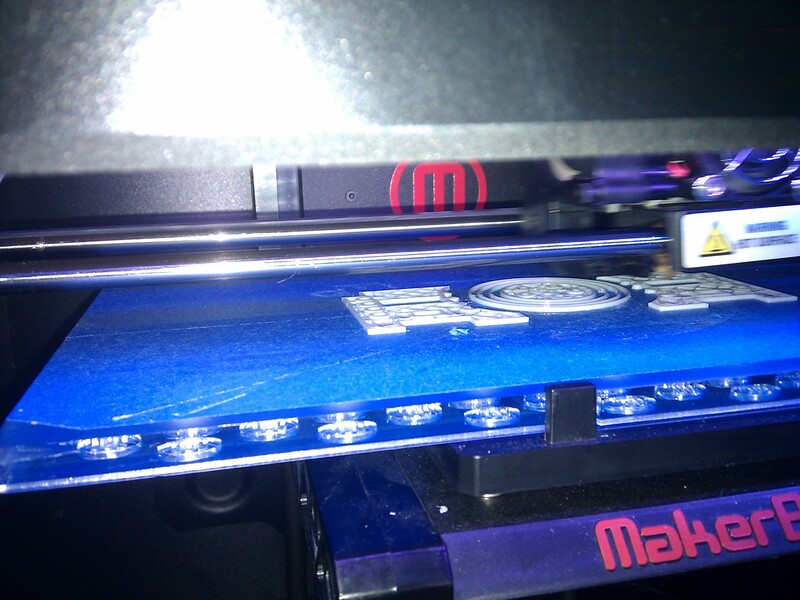 The broken line was caused by a couple of missed steps in the Z axis. The printer has been running for weeks and needs some tweaking. 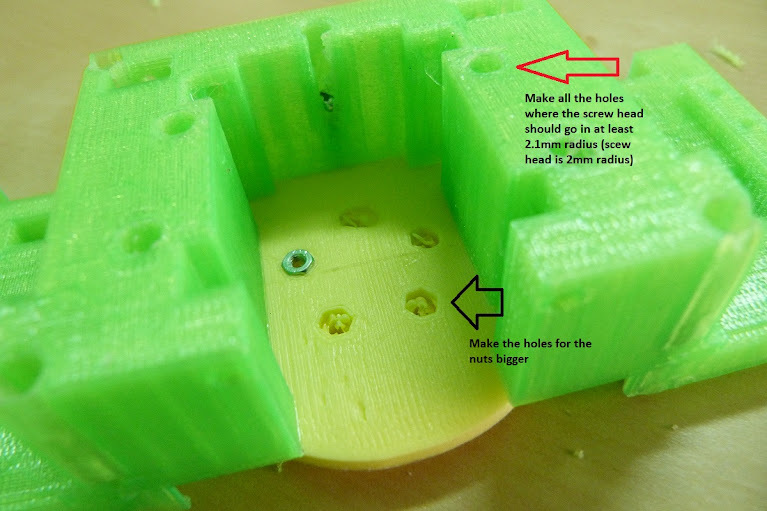 The top part of the hole is distorted because of the bridge that needs to be created. it is normal and it can be fixed by filing the hole smooth. 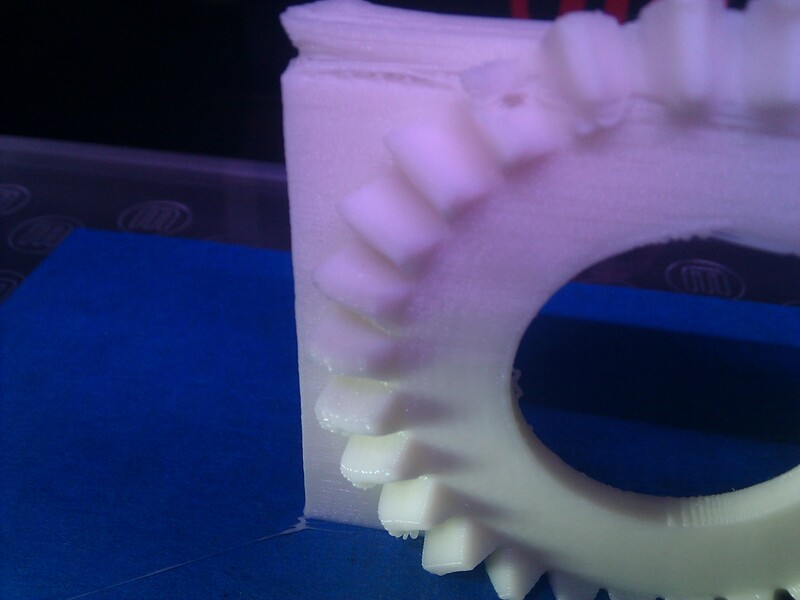 But here comes a serious problem of the upright printed bevel gear. it is oval shaped and slightly distorted. 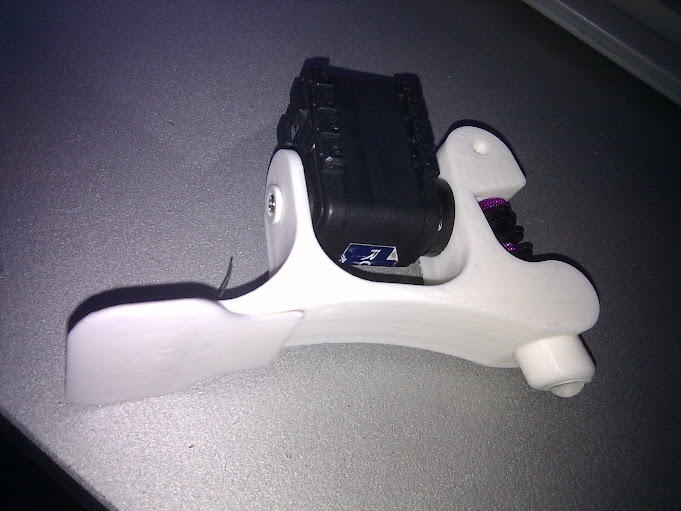 so it doesnt fit onto the other printed part which was printed horizontally. 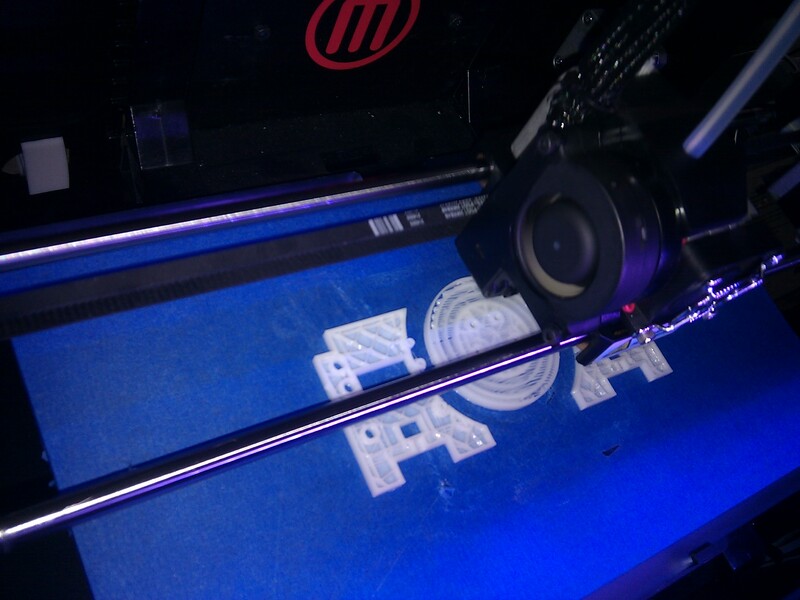 The distortion can be caused by the problematic Z axis on this printer or by the PLA which takes ages to cure. don't care. 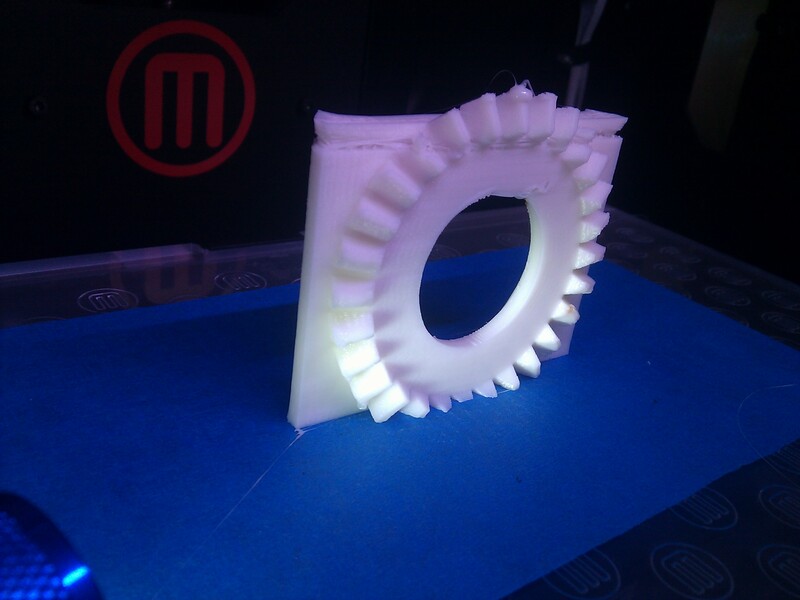 it means that the bevel gear can't be printed upright. 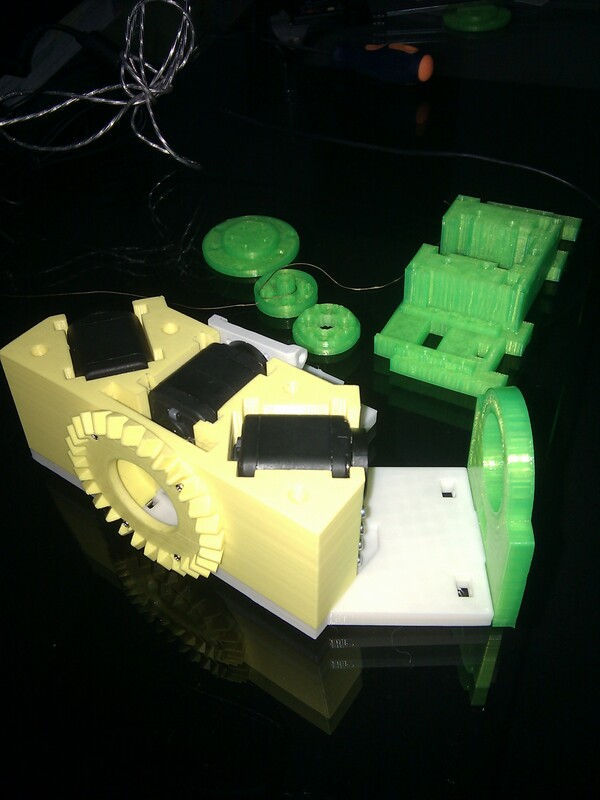 the model needs to be split and printed in two parts and then screwed together. 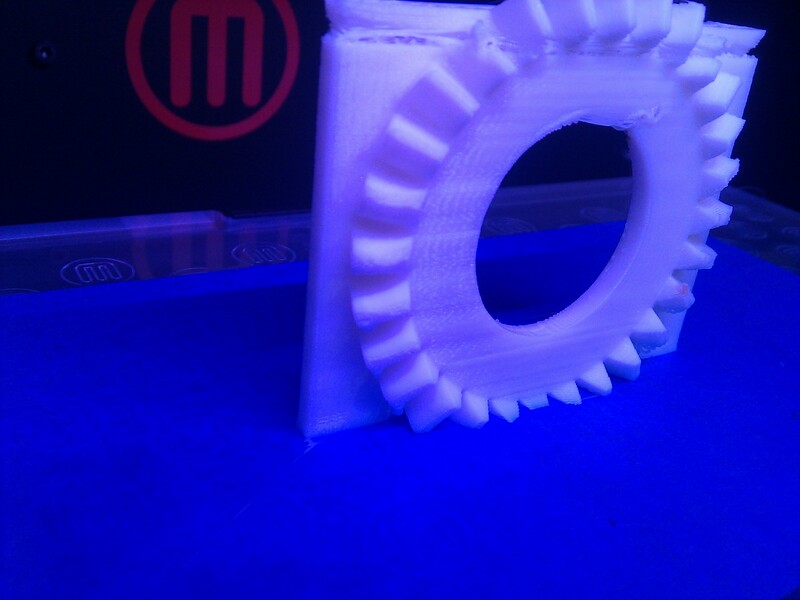 Getting those bevel gears right is going to be tough! 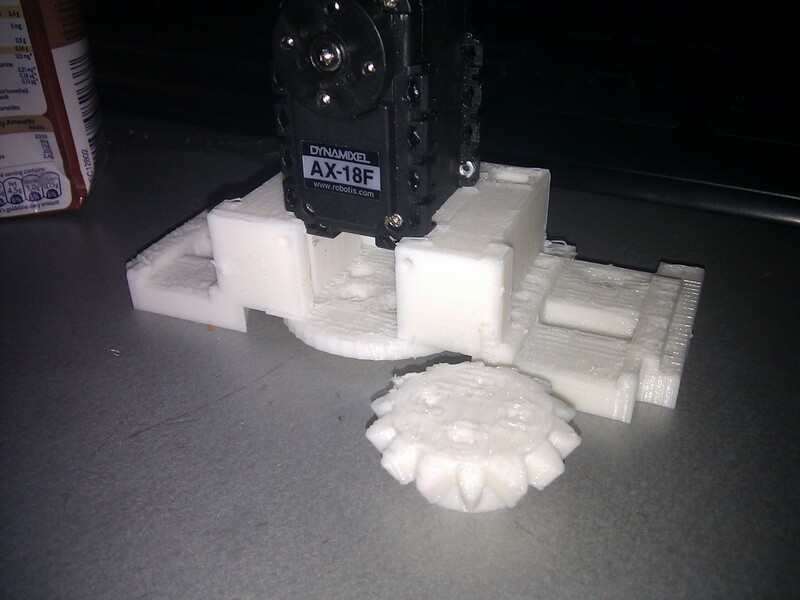 How about mounting the servo with the shaft vertical, with a pinion on the servo, with the servo riding inside of a gear with the teeth facing inward? This would get you the 2:1 you're looking for, and keep the servo shaft rotation in the same plane as the direction of intended rotation. You could then use the outside diameter of the larger "gear" (no teeth on the OD) to secure to the bottom half of the bot. This OD could be used as your wide bearing surface for the top and bottom body halves, there are a lot of options there. I've added support material manually so that the bottom torso roof can be printed upwards. 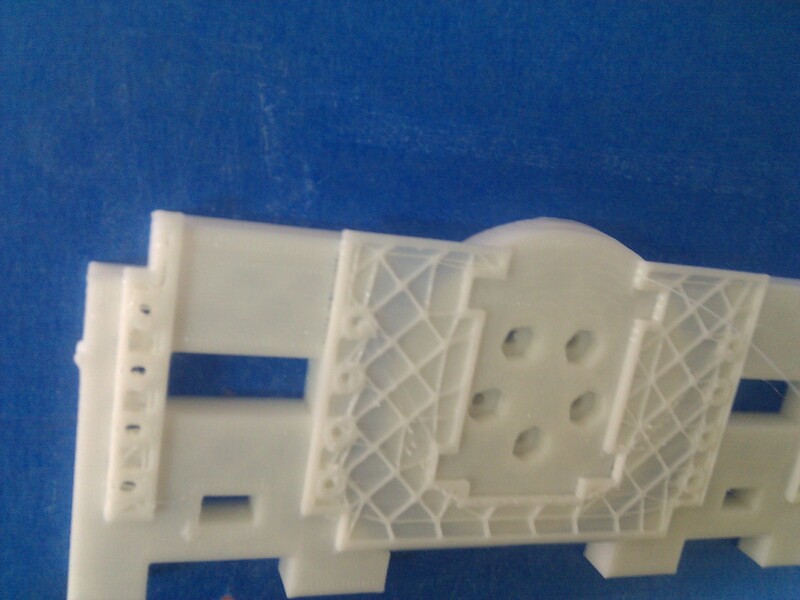 Manual support material is always a better idea for parts with small precise details. 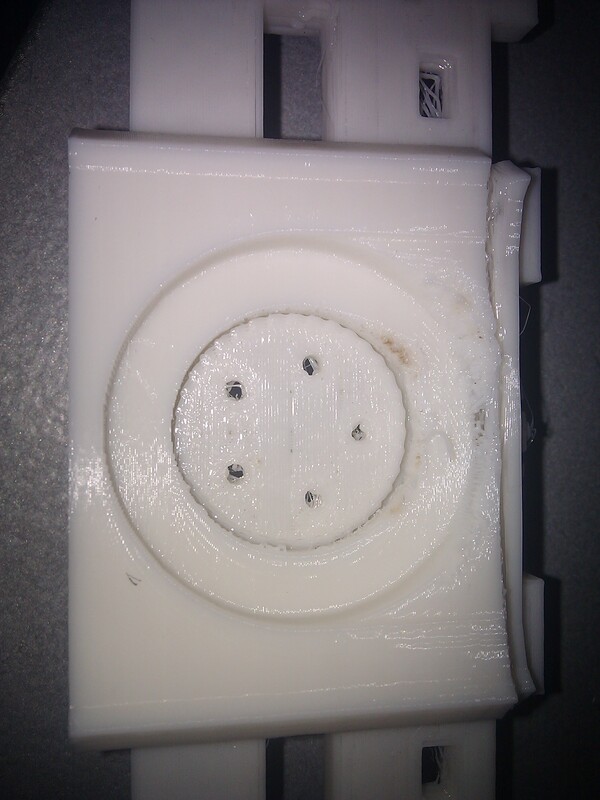 Still no joy even after printing with manual support material. 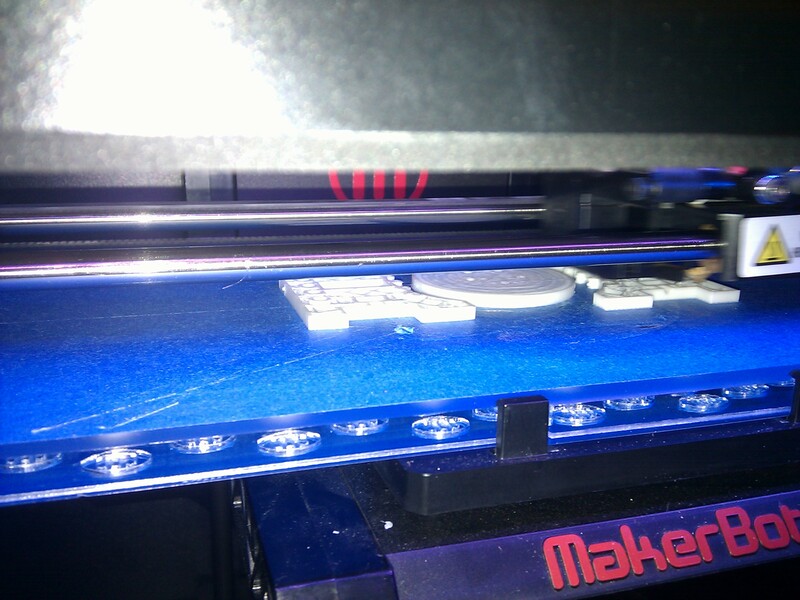 The surface under the "bridge" is very rough and the only other choice is splitting the model up. 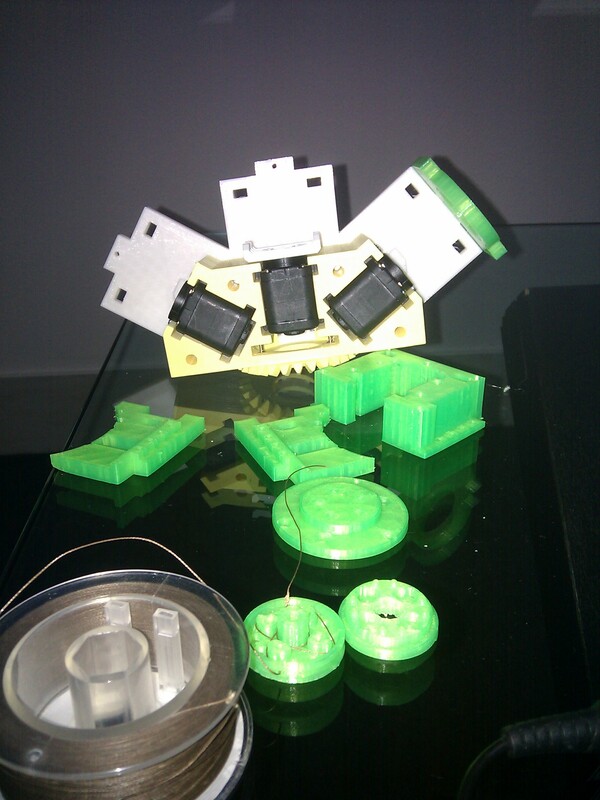 I also took the opportunity to increase the cavity around the servos by about .25mm on each side. Some positive results at last! 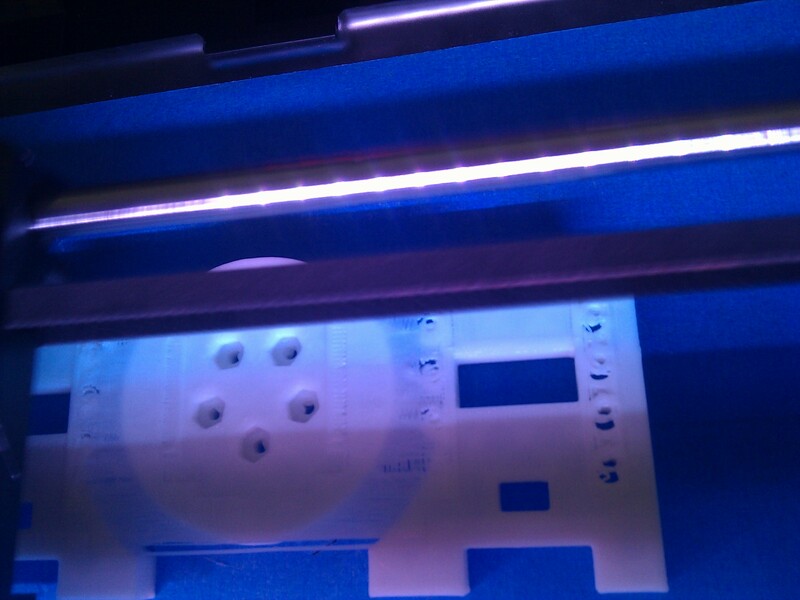 0.2 mm layer thickness looks good after an all-night printing session. AX12 pulley with new fishing wire clamping tricks. still updating the models and print testing. 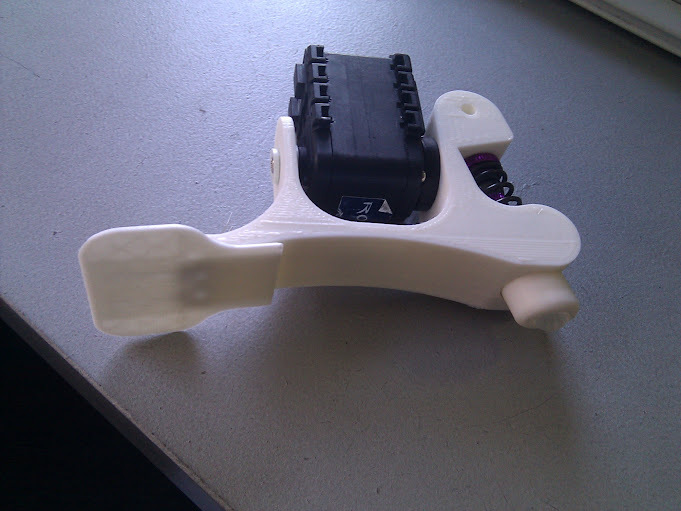 Nuno has been working hard to make my design a bit more 3D printable and various bits resized to have bearings and bolts fit in, some curved edges etc. New foot has a spring loaded toe for better ground traction and human looking walk. 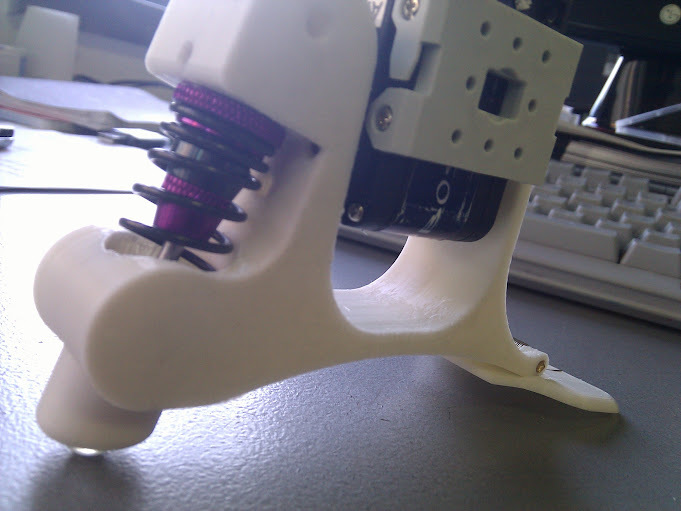 It also has a suspension heel for the same reasons and for easier physics simulation. There's a little rubber half-ball at the tip of the heel. Last edited by limor on Wed Feb 27, 2013 11:02 am, edited 2 times in total. 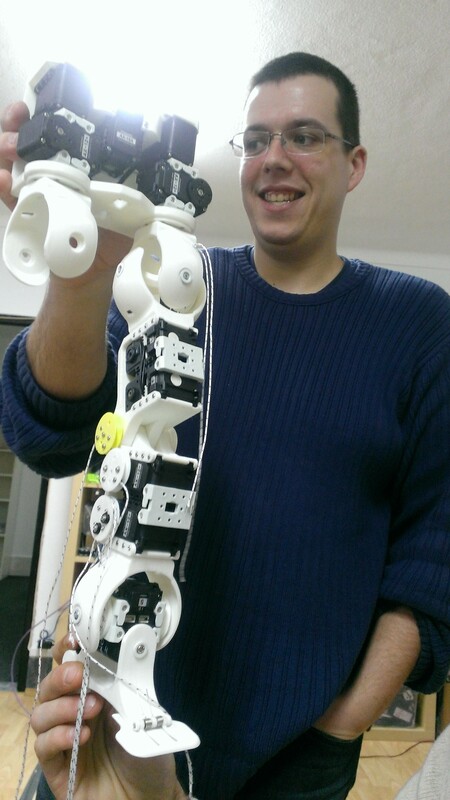 Assembling the pulleys on the X axis of the Universal Joint..
We tightened the fishing wire a bit too much. 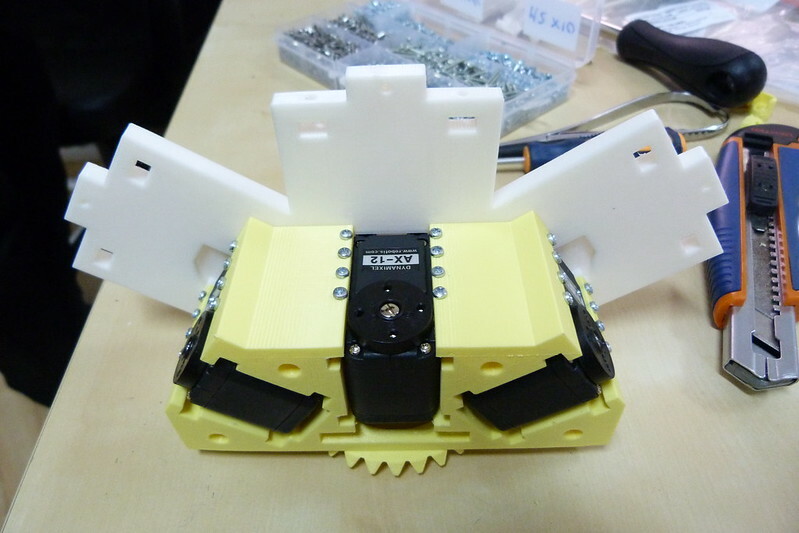 The servo is rated for 12kg pull at 1cm distance from axis. 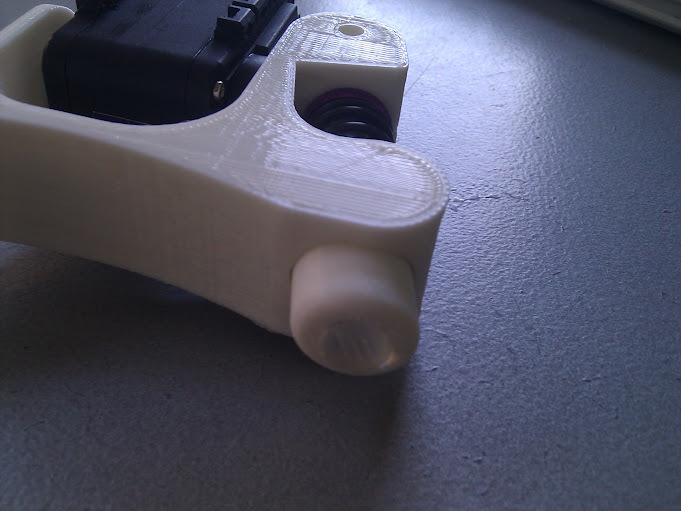 so by creating a permanent pull of over 10kg, it means that any additional external torque will be added to the 10. which means it creates needless excessive side force on the shaft.. it also caused the pulleys to touch (which later burnt the mosfets of the servo) but this is because the 3D printed pulley internal hole radius was too big compared to the metal axis in the knee. conclusion- the clamping and tightning of the wire should be as small as possible while ensuring there is not flex in the cord. After about 9 months of part time work, Franky is born! 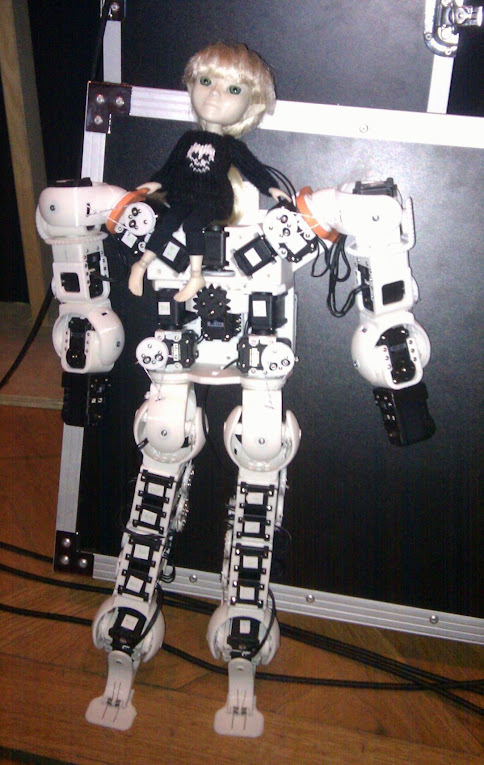 I presented him last week at the Next Berlin conference in front of about 600 people. hopefully they will upload the presentation to youtube. He can't quite walk yet. that will be the next challenge. It looks great! That joints look wonderful!